I only recently became aware of this film that tells in animated form the story of the epic poem the Ramayana that, along with the Mahabharatha, provides much of the foundational myths of Hindus and India. There are many different versions of this epic poem. Like all such myths it blends the life of gods with that of humans, with gods manifesting themselves as people. The basic story is that of the divine prince Rama, his wife Sita, the demon king Ravana who abducts Sita, and her subsequent rescue. My attention was drawn to this article with the title Can You Be Good Without God? and it does not start out well. “If God did not exist, then we would have to invent him,” said the French philosopher Voltaire. His point: that without a divine being to check right and wrong, any number of atrocities are possible and could go unpunished. A recent study (of more than 3,000 people in 13 countries) published in the journal Nature Human Behavior echoes Voltaire’s maxim. The ocean off the southern coast of Sri Lanka sees regular visits of large pods of sperm whales and orcas (killer whales) sometimes numbering as many as 350. This attracts both tourists and marine biologists who study these huge animals. Sperm whales eat a diet that consists mostly of squid while the orcas are meat eaters that will kill and eat sperm whales if they can. Don’t people have better things to do with their time? I have not seen the recent Wonder Woman because I am not a fan of comic book superhero films. But it has been a huge hit and the fact that the superhero in this case is a woman acting alone rather than as a member of a team dominated by men has clearly resonated with a lot of people. 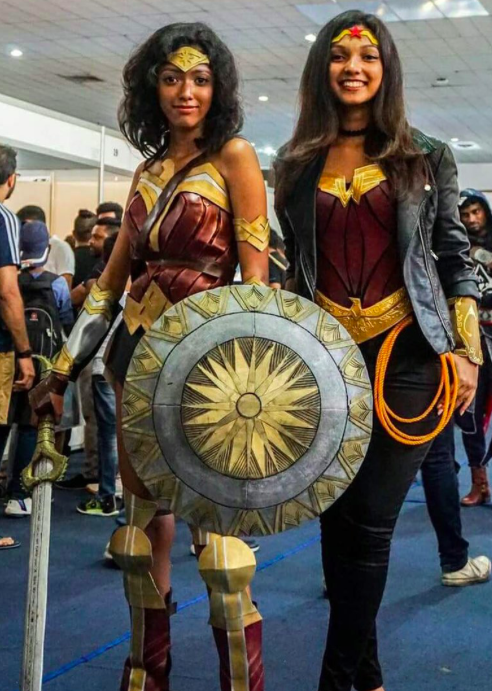 So it was not a surprise when two young Sri Lankan women, inspired by the character, dressed up as her at a Comic Con event in that country, where they were photographed in costume. The story of the police officer who roughly handcuffed and arrested a nurse at the University of Utah hospital because she politely – and rightly – refused to take blood from an accident victim because the officer lacked proper authority has received widespread attention in the media. PZ Myers has also written about it. 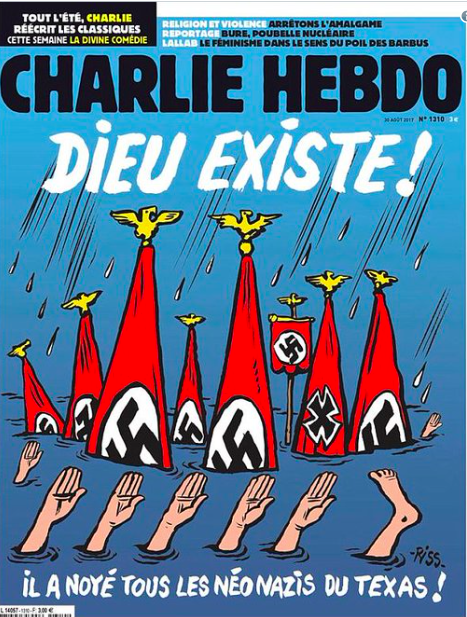 The French satirical magazine Charlie Hebdo has produced an issue whose cover mocked the victims of Hurricane Harvey in Texas as being punished by god for being Nazis. Marcus Ranum sent along this amusing video that describes the napkin ring paradox. Basically it says that if you take any two solid spheres, however much they differ in size, and if you then remove a cylinder of material from each sphere, with the cylinder passing symmetrically through the center of the sphere such that the heights of the remaining solids (which look like napkin rings) are the same, then the volume of the two rings are identical. We are all aware of the advice that in gatherings of family and friends, two topics that should be avoided are politics and religion. I was under the impression that this was a fairly recent development but in reading the book The Scientific Revolution by Steven Shapin (1996), I learned that it dates at least as far back as the 17th century and that such prohibitions were even included in the constitutions of scientific societies. The situation in the US under the Donald Trump administration has become so bad that some people even look back with nostalgia to the era of George W. Bush, even though that administration gave us two criminal wars, the horror of Guantanamo and global black sites, indulged in widespread use of torture, promoted rampant homophobia, and committed horrendous violations of civil rights. Before journalist Barrett Brown was thrown in jail (I have written about this before), he started something called Project PM as a means for getting better civic collaboration and media analysis in order to advance democratic principles and counter the strong authoritarian tendencies that currently exist.